the Samsung Galaxy Super AMOLED Display, and the Motorola Droid. You’re wondering how this could possibly be the case – it’s because Automatic Brightness is being treated by manufacturers as just a marketing feature for brochures and spec sheets (and cursory Energy Star operating cost estimates for HDTVs). As a result it isn’t given the engineering attention and expertise that it needs in order to function properly and effectively, so that it is actually useful, and then actually used by consumers – this latter point is the only one that matters! It’s the Rodney Dangerfield function of smartphones and HDTVs because it “gets no respect.” This article will show you why that needs to change…There are many problems that need to be corrected – some are in the Automatic Brightness control software and its user interface, which can be fixed with downloadable updates, and some have to do with the light sensor, which will have to wait for the next generation of smartphones and HDTVs. We’ll also outline how a fully functional Automatic Brightness should work, including an interactive user interface that adapts automatically to the user’s personal screen brightness preferences. That is the key to its future success and to gaining the respect and appreciation of consumers, manufacturers and even governments. In a smartphone the light sensor is facing your head and is measuring the brightness of your face instead of the ambient light level that is behind and to either side of the phone, which is what actually sets your eye’s light sensitivity and what should be determining the brightness level of the screen. Similarly, in HDTVs the light sensor is measuring the light level behind the TV viewers instead of the light that is behind and on either side of the TV, which again determines the eye’s light sensitivity level. The existing front facing light sensors are good for measuring and correcting the image for glare from screen reflections (by modifying the display transfer functions), but not for setting the screen brightness. To do that in both smartphones and HDTVs a rear and side facing ambient light sensor with a different angular profile than the current Illuminance sensors is needed for future hardware designs. Note that a front sensor for glare is not as important since screen reflectance can be very low – around 5 percent for many smartphones and HDTVs – see Part I of this article. The screen brightness needs to be set carefully and systematically based on the data from the light sensor. Here the smartphones and HDTVs fail again with poor and even bizarre behavior that we document below. Another sign of careless engineering – all three of the smartphones that we tested have operational bugs or errors with their Automatic Brightness. One essential feature missing from both smartphones and HDTVs is allowing users to interactively adjust the display for their own visual preferences on how the screen brightness should vary as the ambient light changes – and it should be accomplished automatically as we’ll outline below. Some people and applications prefer a brighter or dimmer screen, and some people are willing to put up with a dimmer screen that may not be as easy or comfortable to read – in return for longer battery running times. So it’s important to implement a properly functioning Automatic Brightness that automatically adapts to the user’s own brightness preferences – otherwise it will be disabled by the user. Here are the main results from our extensive labs tests and viewing tests on three smartphones that we performed to evaluate the Automatic Brightness Controls and Light Sensors under a wide range of ambient lighting conditions. The first step in evaluating Automatic Brightness is to determine how the screen brightness should change with ambient light level for optimum viewing. To demonstrate the proper relationship I read an article from the New York Times on the iPhone 4 under a wide range of ambient lighting conditions. I turned Auto-Brightness Off and then manually adjusted the screen brightness for my own optimum viewing comfort – not too dim, not too bright, just right – for each of 7 different ambient light levels, from total darkness up through moderate outdoor lighting levels. After each reading I measured the Ambient Light Brightness (Illuminance in lux) and the screen’s Brightness (white Luminance in cd/m2). The results appear as the black data points in Figure 1 along with a solid black trend line. At about 1,000 lux (which is at the low end of outdoor lighting levels) I reached the maximum screen brightness for the iPhone 4, which is 541 cd/m2 – it is the brightest mobile display I have ever measured, but above 1,000 lux the iPhone 4 can’t provide as much screen brightness as I would like to have. The screen is still readable well beyond 10,000 lux (which is full daylight that is not in direct sunlight) but it gets increasingly hard to comfortably make out the contents of the screen at the higher ambient light levels. Figure 1. The measured Screen Brightness for various measured Ambient Brightness levels. The manually determined optimum brightness settings are the black data points with their trend line. The values for five different Auto-Brightness slider settings of the iPhone 4 are labeled Auto Minimum to Maximum. Circles are the data points. The dashed lines show a wide range of alternative brightness relations. The graph is linear from 0 to 2,000 lux and then jumps in steps to 10,000 and 100,000 lux. The labels from Pitch Black to Direct Sunlight roughly identify the lux levels associated with them. 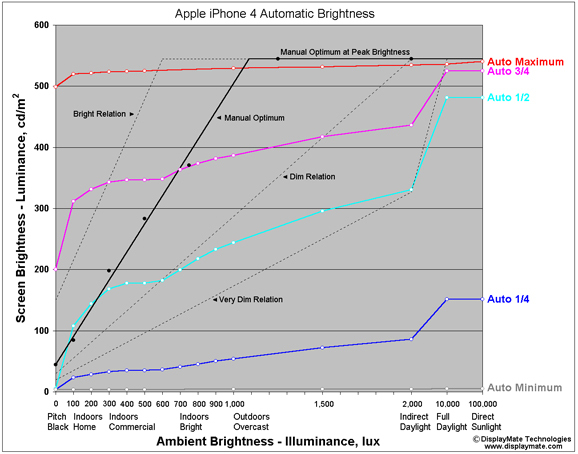 The maximum Luminance of the iPhone 4 is 541 cd/m2. The iPhone 4 comes from the factory with the Brightness slider set to ½ (center) and with Auto-Brightness turned On. At 2,000 lux, where just about everyone will want the display operating at maximum brightness, Auto-Brightness sets it to only 60 percent of maximum, so Auto-Brightness is throwing away 40 percent of the precious brightness needed for screen visibility. And at 10,000 lux, which is full daylight, the screen brightness is still below 90 percent of maximum. The ¾ setting is much too bright and power wasteful for all indoor viewing and yet it still throws away 20 percent of the screen brightness at 2,000 lux for outdoor viewing. The Maximum setting is useless because it varies the screen brightness (and power) by less than 10 percent and the ¼ and Minimum settings are far too dim to be useful for humans. Figure 2. 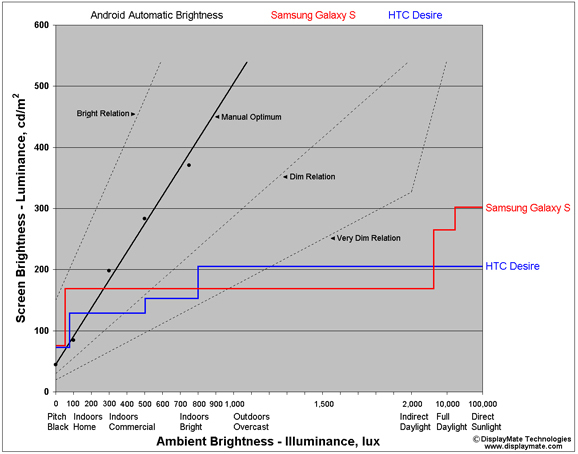 The measured Screen Brightness for various measured Ambient Brightness levels for the Samsung Galaxy S and HTC Desire. The Manual Optimum relation and other elements are the same as in Figure 1. Both of the Android phones we lab tested have their own Auto Brightness operational errors or bugs. On the Samsung Galaxy S two of the four Android Automatic Brightness levels are set ridiculously high: 7,000 and 30,000 lux – they are about a factor of 10 too high to be useful. The Galaxy S screen brightness remains at an incredibly low 170 cd/m2 up until near Full Daylight, only about 50 percent of the screen brightness that it can deliver, and it waits up until almost Direct Sunlight to move up to it’s maximum screen brightness of 305 cd/m2. Since there are no available settings or adjustments it’s better to leave the Automatic Brightness permanently off until this gets fixed with a software update. The HTC Desire has a somewhat better choice of brightness level breakpoints than the Galaxy S, but it has a bug similar to the iPhone – once the light sensor detects a light level over 100 lux it won’t allow the screen below Android brightness Level 2 until the display is cycled off by going into sleep mode using the power button or Screen timeout. We’ve already shown that Automatic Brightness is important and is currently functionally useless on smartphones and HDTVs for many reasons. We’ve also discussed some of the changes needed for the Ambient Light Sensors, but by far the most important factor is getting the user interface for screen brightness to work properly so that consumers can use it to adjust the screen brightness based on their own visual preferences, in a natural fashion that automatically implements and tweaks the screen brightness they would like to see for different ambient lighting conditions. That will maximize viewing comfort, screen readability, energy efficiency and battery run time if it’s done correctly. Right now the user interface for brightness controls is completely backwards – the Light Sensor measures the ambient light and the smartphone or HDTV adjusts the screen brightness based on some ad hoc and mysterious algorithm based on an earlier user setting of a brightness control. The solution is very simple – do it in the opposite way – the consumer initially adjusts the screen brightness manually to whatever they want for the current ambient lighting. The Ambient Light Sensor then measures this light level. The value is recorded and used to interpolate the screen brightness whenever the ambient lighting changes. In principle, only two such user settings are needed to train the Automatic Brightness for a linear interpolation as shown in Figure 1. Whenever the user doesn’t find the current screen brightness to their liking, they manually tweak the brightness and the new value and ambient light level are used to update the Auto Brightness calibration. There is one more thing… to make this work smartphones and TVs need a convenient brightness control to tweak and train the Automatic Brightness. Every TV and smartphone in the solar system has a convenient Volume Control but in most cases you have to go down a couple of menu levels to get to a cumbersome Brightness Control. My suggestion for all smartphones: temporarily shift the Volume buttons to Brightness buttons by pressing both the + and – buttons at the same time – which will activate a temporary Brightness Shift. It’s fast, convenient and easy, and then have them automatically time out and shift back to Volume Controls when you’re done adjusting the brightness. This same suggestion applies to TV remote controls – use a shift button to temporarily convert the Volume Control buttons into Brightness Control buttons. Every display needs a convenient external Brightness Control – not buried under several levels of menus. In all cases it’s best to implement it using the existing Volume Control together with an appropriate shift button. Special Thanks to Jay Catral and Konica Minolta Sensing for their instruments and technical support. To measure the Ambient Light Brightness (Illuminance in lux) we used a Konica Minolta T-10 Illuminance Meter and for screen Brightness (Luminance in cd/m2) we used a Konica Minolta CS-200 ChromaMeter. DisplayMate Technologies specializes in advanced mathematical display optimizations and precision quantitative and analytical scientific display manufacturer calibrations to deliver outstanding image and picture quality and accuracy while increasing the effective visual Contrast Ratio of the display and producing a higher calibrated brightness than is achievable with traditional calibration methods. This also decreases display power requirements and increases the battery run time in mobile displays. Our scientific optimizations can make lower cost displays look almost as good as more expensive higher performance panels. For more information on this technology see the Summary description of our Adaptive Variable Metric Display Optimizer AVDO. If you are a display or product manufacturer and want to turn a standard panel into a spectacular one Contact DisplayMate Technologies to learn more.